Bent is a romantic comedy about a womanizing, surfer dude contractor and his beautiful, no-nonsense, type-A client, who work together to remodel each other's lives as they renovate her Venice, California home. On the surface, Alex (Amanda Peet, Studio 60 on the Sunset Strip) and Pete (David Walton, Perfect Couples) could not be more different. The recently divorced Alex is a hard-working, high-strung lawyer who is raising her 10-year-old daughter, Charlie (Joey King, Ramona and Beezus), as a single mom following her husband's incarceration for insider trading. Unwilling to let anything get in her way, she downsizes into a smaller house and hires the charismatic Pete, a free-spirited lothario and recovering gambling addict who desperately needs this gig with Alex to jumpstart his life - and prove that he is no longer irresponsible. Alex quickly realizes that she has met her match in Pete, who along with his motley construction crew, will not only tear apart her kitchen, but transform her worldview in the process. Complicating the dynamic is Ben (Matt Letscher, Eli Stone), a successful doctor who Alex is dating. While not as smooth as Pete, he continually finds himself in a tug-of-war for not only the affections of Alex, but for her daughter Charlie. Pete's home includes his narcissistic, roommate father, Walt (Jeffrey Tambor, Arrested Development), a serially unemployed actor who is still yearning for his big break. Meanwhile, Alex's family life incldues her wild younger sister, Screwsie (Margo Harshman, Sorority Row), who, unfortunately for Alex, seems to be cut from the same reckless cloth as Pete. Amanda Peet (Alex) is an accomplished and versatile film actress who is best known for her diverse choice of roles in romantic comedies, dramas and thrillers. On television, audiences first warmed to Peet when she starred as Jack on the hit drama, Jack and Jill. She later starred as Jordan McDeere on Aaron Sorkin's Studio 60 on the Sunset Strip alongside co-stars Matthew Perry and Bradley Whitford. Her many big screen credits include the successful disaster film 2012, directed by Roland Emmerich and co-starring John Cusack; Gulliver's Travels, starring Jack Black and Jason Segel; the dramatic comedy Please Give, directed by Nicole Holofcener and co-starring Catherine Keener and Rebecca Hall; the Oscar-nominated thriller Syriana, also starring Matt Damon, George Clooney and Chris Cooper; A Lot Like Love in which she starred opposite Ashton Kutcher; Woody Allen's Melinda and Melinda opposite Will Ferrell; the mafia comedy The Whole Nine Yards and its sequel The Whole Ten Yards; Something's Gotta Give with Jack Nicholson and Diane Keaton; the thriller Identity, alongside John Cusack and Ray Liotta; High Crimes, opposite Morgan Freeman and Ashley Judd; Changing Lanes, also starring Samuel L. Jackson, Ben Affleck and Sydney Pollack; and Igby Goes Down, where Peet appeared as Jeff Goldblum's mistress, a beautiful and privileged young woman who is hooked on drugs. David Walton (Pete), a Boston native, started acting in high school but began his formal training at Brown University. He studied at The Actor's Center as well as The British American Drama Academy. Shortly after moving to New York City, Walton was quickly cast in a Naked Angel's production of One Day on Wall Street. His commendable performance caught the attention of an executive who cast him in the series Cracking Up, starring alongside Jason Schwartzman, Molly Shannon and Christopher McDonald. Since then, he has starred in several television series including The Loop, Heist, as well as Quarterlife and 100 Questions. He was last seen starring in the comedy Perfect Couples. On the big screen, Walton's most recent film successes include Fired Up, and Steve Antin's Burlesque, where he played the love interest of Stanley Tucci's character. Jeffrey Tambor (Walt) has earned deep respect for being one of the most versatile and accomplished character actors in film and television. He has been awarded numerous honors for his professional work, including six Emmy nominations, two Screen Actors Guild Awards and a nomination for a Television Critics Association Award for Outstanding Individual Achievement in a Comedy Series. His unforgettable roles in such popular programs as The Larry Sanders Show and Arrested Development reveal his unique comedic gifts, while his appearances in films such as And Justice for All and Meet Joe Black display the depth of his dramatic sensibilities. For six seasons beginning in 1992, Tambor had one of television's most memorable roles as Hank Kingsley, the self-centered sidekick to talk show host Larry Sanders on the critically acclaimed The Larry Sanders Show. He went on to star in the hilarious Emmy Award-winning sitcom Arrested Development for three seasons as twin brothers George Bluth Sr. and Oscar Bluth. His vast credits include the two Hellboy films, The Hangover, The Invention of Lying, There's Something About Mary, City Slickers, Miss Congeniality, Dreamchasers, Mr. Mom, Brenda Starr, Radioland Murders, Doctor Dolittle, Pollock and How the Grinch Stole Christmas. Other recent big screen features include Mr. Popper's Penguins, Flypaper, Paul and Win, Win. Margo Harshman (Screwsie) was born in San Diego and is the youngest of four children. Her performing career began at the age of two, when her grandmother entered her in a local beauty pageant where she was quickly noticed. Margo's love of acting blossomed when she worked with Coast Kids Theatre in San Diego and at the age of 12 she found herself auditioning for theatrical and commercial jobs. Her guest-starring roles on television include Modern Family, Boston Legal, 90210, Grey's Anatomy, Everwood and Without a Trace. She spent three years as Tawny, alongside Shia LaBeouf, on the hit cable series Even Stevens. She also starred in Run of the House with Joey Lawrence, and later appeared in Center of the Universe where she co-starred with John Goodman. Harshman's film credits include a variety of studio and independent features including Fired Up, the romantic comedy Keith, Simon Says with Crispin Glover, From Within and Sorority Row. Joey King (Charlie) began her career at age four when she booked several national commercials for brands including AT&T, Eggo, Life Cereal and McDonalds. King was soon making the television show rounds, and by the age of six had appeared on CSI, Entourage and Medium. King recently wrapped filming on Christopher Nolan's The Dark Knight Rises and is currently in production on the 3D fantasy picture Oz: The Great and Powerful, helmed by Sam Raimi, in which she will portray the role of China Girl. Other film credits include Crazy, Stupid, Love, the sci-fi action film Battle Los Angeles directed by Jonathan Liebesman, and as Ramona Quimby in the family movie Ramona & Beezus, sharing the screen with Selena Gomez. In addition to her work in front of the camera, King has lent her vocal talents to the hit animated feature films Dr. Seuss' Horton Hears a Who! and Ice Age: Dawn of the Dinosaurs. We received all six episodes for review purposes. "Pilot" (March 21, 9:00PM) - Recently divorced Alex is a high-strung lawyer raising her 10 year-old daughter Charlie as a single mom. Unwilling to let anything get in her way, she downsizes into a smaller house and hires charismatic contractor Pete, a free-spirited, recovering gambling addict who is a ladies man and in desperate need of this gig. Upon hiring him, Alex quickly realizes that she has met her match in Pete, who along with his motley construction crew, will not only tear apart her kitchen but transform her worldview in the process. Jeffrey Tambor stars as Pete's narcissistic live-in father Walt and Margo Harshman stars as Alex's wild younger sister Screwsie. "Smitten" (March 21, 9:30PM) - Fed up with her lack of a love life, Alex devises a way to take her relationship with her boyfriend Ben (guest star Matt Letscher) to the next level. Meanwhile, in spite of his feelings for Alex, Pete rekindles his romance with ex-girlfriend Natalie (guest star Diora Baird), but repercussions quickly unfold. Elsewhere, with hopes of winning over Alex, Pete and Ben vie for Charlie's attention. "HD" (March 28, 9:00PM) - When Pete and the crew spot Ben in a precarious situation with another woman, Pete is determined to expose Ben's transgression to Alex. Meanwhile, Walt and Screwsie help Charlie get back at a school bully. "A-Game" (March 28, 9:30PM) - When Alex is invited to a wedding at her boss Bob's (guest star Larry Miller) home, she invites Ben, hoping he can aid in her efforts to impress the partner's wives. When a last-minute emergency arises, Ben is forced to leave and Pete comes in to try and save the day. Meanwhile, Screwsie is offered the catering job for the wedding and enlists Walt's help. Elsewhere, Alex's necklace goes missing and the crew falls under suspicion. "Mom" (April 4, 9:00PM) - When Pete's mom Vanessa (guest star Marcia Gay Harden) returns to town, Walt is determined to win back his ex-wife at any cost. Meanwhile, following Pete's no-show at work, Alex worries he may have succumbed to old habits. Elsewhere, Screwsie entrusts the care of her boss's less-than-friendly cat to Gary, who has alterior motives for his helpful ways. "Tile Date" (April 4, 9:30PM) - While on a romantic getaway to Napa with her boyfriend Ben, Alex experiences a romantic dream involving Pete that causes her to question her true feelings. Meanwhile, Alex's new neighbor Dan (guest star Kyle Bornheimer), fed up with the crew's antics and destructive behavior, threatens legal action. Elsewhere, Walt prepares for opening night of his latest theatre production and Gary professes his feelings for Screwsie. Bent is a single-camera comedy. There's no laugh track added. The series is produced by Universal Television and Rosalita Productions Inc. Tad Quill (Scrubs, Spin City) created the show and wrote the pilot episode. Craig Zisk (Nurse Jackie, Weeds) directed the pilot. 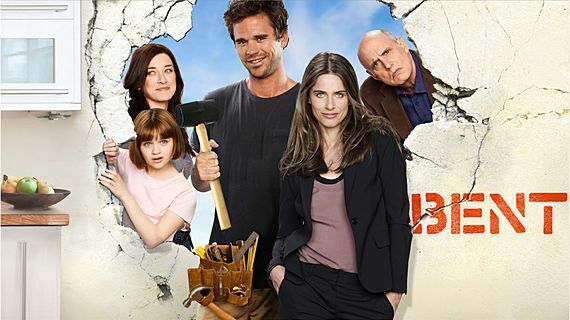 The cast regulars include Amanda Peet, David Walton, Jeffrey Tambor, Margo Harshman and Joey King. Rounding out the ensemble are recurring guest stars J.B. Smoove, Jesse Plemons, Pasha Lychnikoff and Matt Letscher. The "Pilot" opens with a scene of Pete getting out of bed with Tara, who he can't remember her name. Alex wakes up next to Charlie. After attending a Gamblers Anonymous meeting, Pete meets Alex to talk about remodeling her house. Pete talks to his construction crew about the job. Screwsie asks Alex about Pete. Pete talks to Walt and gives him a ride to Save On. Alex hires Pete for the job and the guys celebrate. Screwsie tells Alex that she thinks that she has met Pete in the past. Alex talks to Charlie at the beach about her father who is in prison. Pete later rescues Charlie from the roof and has a chat with her about her father. The boys have some drinks that night where Pete meets the babysitter/nanny Simone. They end up sleeping with each other. Alex ends up firing him after Dave drops her off the next morning. Alex and Screwsie talk about Pete. Pete talks to Charlie and takes her shopping to Timball's. Charlie practices playing the piano with Walt. Alex agrees to give Pete another shot at the job. Alex's boyfriend Ben also arrives at the store and briefly meets Pete. Pete shows Alex the new skylight he has installed. I enjoyed the Pilot, but I feel like they tried to cram too many scenes and information into it. There's just so much happening in the pilot with all of the characters. With only six episodes produced, it appears a little rushed and stitched together. Episodes two-six have a slower pace that have fewer and longer scenes. It's unusual to see a single-camera comedy without any narration, characters talking to the camera, flashback scenes or quick cutaways these days, but the straighforward approach works fine for this series. The show doesn't really use a lot of music, but the 1-2 songs they use in each episode are effective for the scenes. There are a couple of Fleetwood Mac songs used in the Pilot and some romantic classics in other episodes. Some familiar faces make some guest appearances in episodes two-six. The lovely Diora Baird appears in her daisy dukes in the second episode as an ex-girlfriend of Pete. Other guest stars include Larry Miller, Joel Brooks (in 2 episodes), Marcia Gay Harden and Kyle Bornheimer. The cast appears to have some good chemistry and work well together. The beautiful and funny Amanda Peet has appeared in a number of romantic comedies, so this isn't really new territory for her. It's always a joy to see her in films and on the small screen. David Walton has appeared in a couple of other short-run NBC comedies in Perfect Couples and 100 Questions. His characters have been similar to Pete, but this seems like the best vehicle for him. The construction crew of J.B. Smoove, Jesse Plemons and Pasha Lychnikoff is a unique bunch. The humor of the trio is a bit juvenile and slapstick in nature, but they add much of the comic relief to the show. J.B. Smoove is the standout of the group. He has the best lines and reminds me a lot of Jimmie Walker. Jeffrey Tambor is a bit underutilized in some of the episodes, but you know he will always bring the laughs. I think the father/son scenes between Pete and Walt are especially hilarious. They could have used more of them. The character of Ben is the least interesting and funny. It seems like he was added almost as an afterthought. I can understand why they included him, but it seems like he was just added to the pilot at the last moment. Margo Harshman and Joey King don't receive a lot of scenes compared to the rest of the cast, but they do well with their screen time. Bent has been pitched as a romantic comedy, but it doesn't always seem like one. The pilot episode is more like a family/general comedy. That's probably how it should be promoted to gain wider appeal. The main problem I see with the series is that it feels like there are three different shows in one. There's Alex's relationship with Ben, Screwsie, Charlie and Pete. Then there's the construction crew doing their thing. Finally, there's the storyline of Walt being an unemployed actor. The storylines and characters just seem too loosely connected at times. A consistently funny show like Modern Family can pull this off, but it doesn't work as well here. Many of the scenes in the pilot are very short and quickly edited together. They improved this in later episodes. I feel like everything was coming together for them by the sixth episode. NBC ordered six comedy pilots for this season, but they really haven't had much success with any of them at this point. Up All Night is probably the best of the group, but it's still struggling in the ratings. Bent is a pretty decent effort by them. There's really nothing truly unique about the premise of the show, but after watching all six episodes it's a fun and entertaining series. I would like to see more from this talented and funny cast. All of the characters are a bit offbeat but likable. I was expecting more romance and dating, but the last few episodes have more of the romantic comedy type feel. The relationship between Alex and Pete is just a bit slow to develop. By the end of the sixth episode, I think viewers will want to see more of Alex and Pete together, as well as the budding relationship of Gary and Screwsie. The series will be airing back-to-back episodes for the next three weeks at 9-9:30 and 9:30-10:00pm ET/PT. Unfortunately, this is a killer timeslot for them. It's hard to see them receiving much sampling because they will probably get lost in the shuffle. Any series would have had a difficult task going against American Idol, Criminal Minds and Modern Family (even when it's in repeats). It will be especially challenging for a rookie show with a weak lead-in. NBC hasn't really given the show much promotion and quietly placed it on the schedule. It seems like they are just burning off the 6 episodes as quickly as possible. I can understand their desire to have new programming every week, but this show deserved better treatment. I think the show would have had a better chance at gaining an audience if it aired in an earlier timeslot after Betty White's Off Their Rockers. If you are a fan of Amanda Peet, Jeffrey Tambor or any of the actors, this will be a series that you will want to quickly check out. There won't be a big time commitment because of the limited number of episodes produced. Discuss the show after you watch it on Wednesday, March 20 on our message board. Antenna TV has a nice joke marathon for you! We hinted a few weeks ago that a special marathon was coming April 1, and we can now reveal that to you! Celebrate April Fool's Day with a "fool" day of Benny Hill and the Three Stooges. Antenna TV, which airs on 61 affiliates across the U.S. reaching 58% of TV households, kicks off the April Fool's Day marathon with 27 hours of yuks (12 midnight ET on Sunday, April 1 through 3am ET on Monday, April 2) featuring The Benny Hill Show and The Three Stooges. The marathon begins at the stroke of midnight on Sunday, April 1 with The Benny Hill Show (14 episodes/7 hours.) The Three Stooges portion of the marathon begins at 7am ET and includes 45 classic Stooges episodes. The Benny Hill Show returns at 10 pm ET and with another 10 episodes running through 3am ET on Monday, April 2. And don't forget Antenna TV starts their Spring schedule next week (March 26) and will add WKRP in Cincinnati to its line-up a week after this April Fool's Stunt.